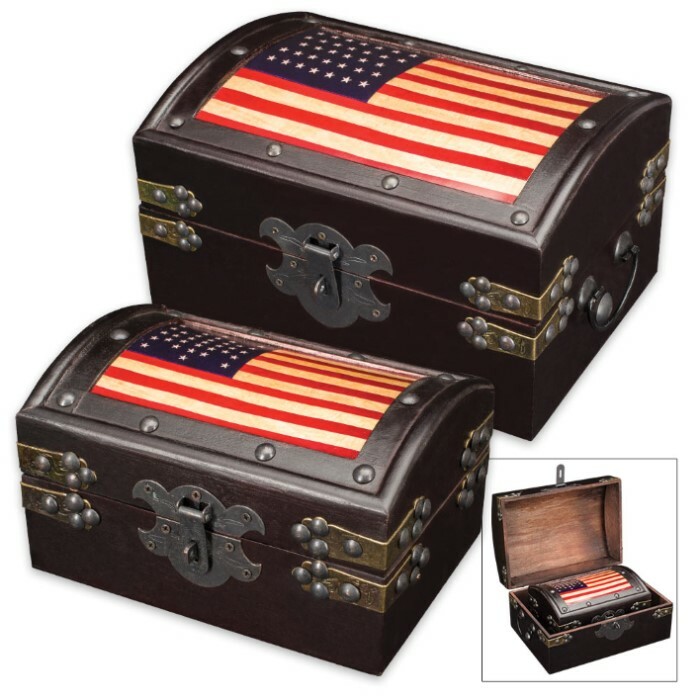 American Flag Rustic Wooden Trunk Set | BUDK.com - Knives & Swords At The Lowest Prices! 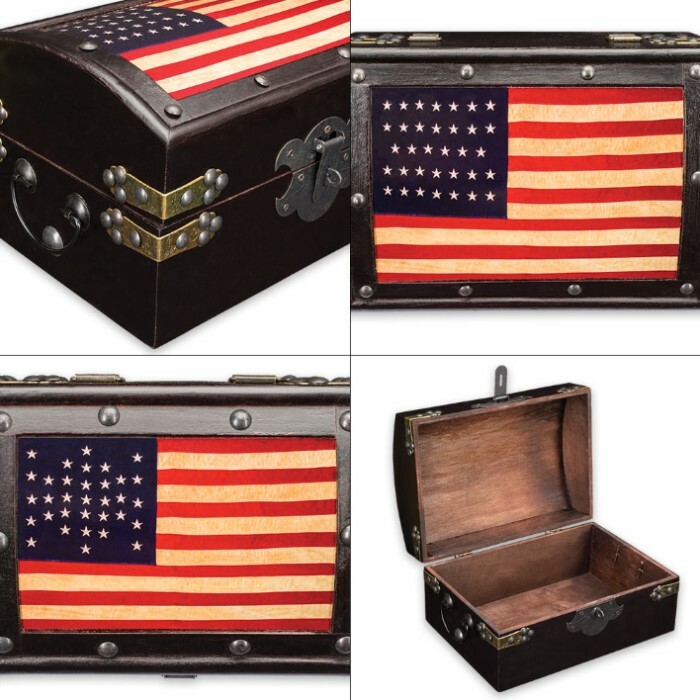 This rustic wooden trunk set hits the trifecta - it livens any room, boasts countless uses and is a stylish way to showcase your proud American patriotism. With the trunks’ antique metal hardware and other charming accents, the pair also adds a touch of pastoral grace to any space in your home or office. Painted in brilliant red, white and blue on the gently sloping hinged lids are two stately American flags. At 9 1/2" wide x 6 1/2" deep x 5" high, the large chest is perfect for keeping toiletries and personal items neatly tucked away in your bathroom; housing measuring cups, spices or other kitchen essentials on a counter or table; or keeping your remote, TV guide and a bag of snacks easily within reach - instead of hopelessly wedged between couch cushions - in a living room, den or man cave. 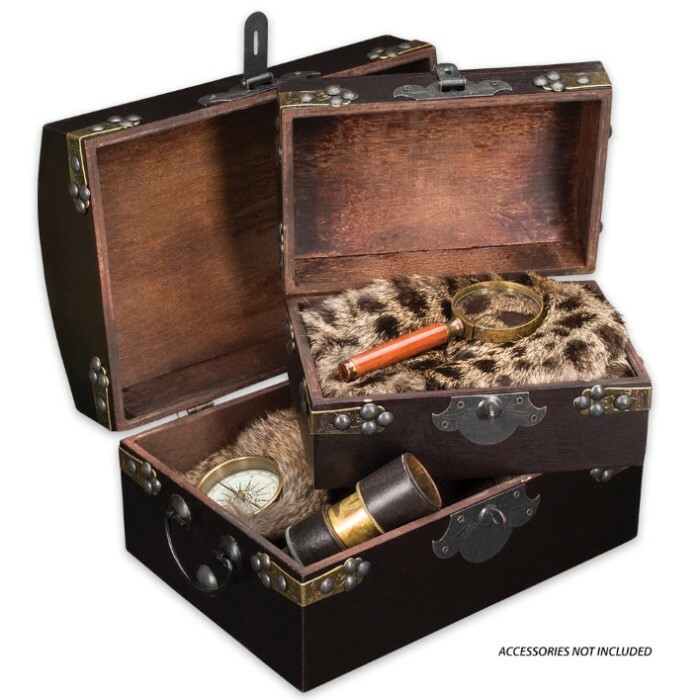 The 7" wide x 4 7/8" deep x 3 1/2" high chest is equally useful - great for smaller items like jewelry, pens and pencils, sewing kits, coin and stamp collections and other slight knick-knacks. These are but a few ideas; the possibilities are truly endless! Working latches and hinges allow for spill-free opening and closing, and hinged metal handles on the sides make these wooden “Old Glory" trunks easy to transport from room to room or bring along on trips. Regardless of what you decide to do with them, these eye-catching wooden trunks will dress up and embolden any room in your home or office and are sure to draw attention and praise. They also make fun, memorable gifts for fans of rustic home decor or proud Americans of all stripes!